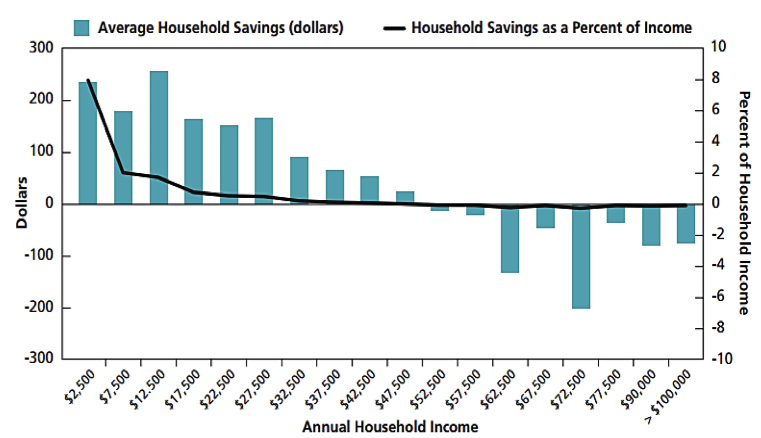 Consumer savings, affordability and fairness. A typical motorist who reduces vehicle mileage 10-15% will save $100-150 annually, representing the claim cost savings from reduced exposure. Since lower-income motorists tend to drive their vehicles less than average, they tend to save most. 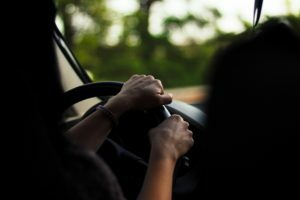 It increases fairness: current insurance pricing overcharges motorists who drive less than average and undercharge those who drive more than average in each rate category. It will also allow some households to keep a seldom-used vehicle, such as an old truck for errands or a recreational vehicle. Reduced pollution emissions. The predicted 10-15% travel reduction should provide comparable reductions in energy consumption and pollution emissions (Cambridge Systematics ranked PAYD as one of the most cost effective climate change emission reduction strategy available). Traffic safety. Vehicle crashes should decline more than mileage (a 10% mileage reduction should reduce crashes 12-15%) because higher-risk motorists, who pay higher premiums, have the greatest incentive to reduce their driving. Reduced Traffic congestion and roadway costs. Everybody can benefit from PAYD pricing that reduces vehicle traffic and associated costs. Several types of evidence indicate that PAYD pricing can reduce lower-value vehicle travel and traffic crashes. The first consists of general research on the relationships between per capita vehicle travel and per capita traffic casualty rates, as illustrated in Figure 1, and disaggregated data for individual vehicles, as illustrated in Figure 2. 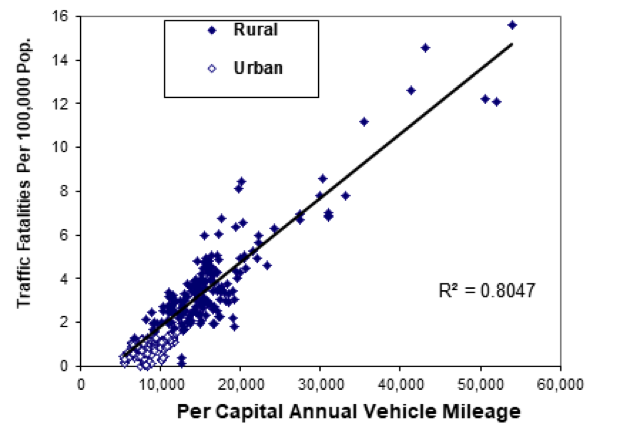 This graph indicates a strong positive relationship between per capita annual vehicle mileage and traffic fatalities in U.S. states, particularly in rural areas. 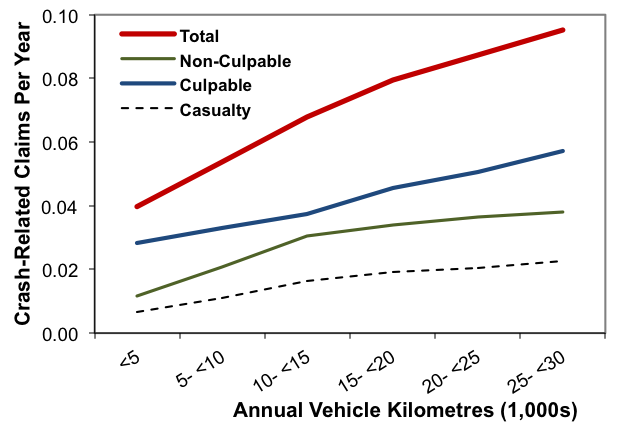 This graph shows that crash frequency tends to increase with a vehicle’s annual kilometers. This relationship is probably even stronger than these graphs illustrate due to confounding factors not included in the analysis. This provides an actuarial justification for PAYD pricing: prorating premiums by mileage makes them fairer and more economically efficient. A major study that matched insurance claim cost and annual mileage data collected during emission inspections for 2.8 million vehicle-years found a significant correlation between a vehicle’s annual mileage and its chance of having a crash and insurance claim. Since mileage is just one of several important risk factors, it would not be actuarially accurate to charge all motorists the same per-kilometer premium, as with pay-at-the-pump insurance, but premiums more accurately reflect a vehicle’s claim costs if annual vehicle travel is incorporated with other rating factors. About two-thirds of casualty crashes involve multiple vehicles, so reductions in total vehicle travel in an area can provide proportionately larger crash reductions, since these reductions reduce both internal risk to the vehicle that reduces its mileage, and the risk it imposes on other road users. In other words, each road user is safer if other motorists reduce their vehicle travel since this reduces their exposure to other drivers’ errors. It has been found the elasticity of claim costs with respect to mileage is between 1.42 and 1.85, meaning a 10% reduction in vehicle mileage reduces total crashes 14-18%. Good research indicates that prices affect vehicle travel and crash rates. Using international data, Ahangari, et al. (2014), and Burke and Nishitateno (2015), found that a 10% gasoline price increase reduces traffic fatalities 2-6%. Using U.S. data, it is estimated that Sivak (2008) and Grabowski and Morrisey (2004) estimate that each 10% fuel price increase reduces total traffic deaths 2.3% or more, with larger reductions by younger drivers, apparently because they are particularly price-sensitive. Additionally, it is estimated that each one-cent state gasoline taxes increase reduces per capita traffic fatalities 0.25%. Leigh and Geraghty (2008) estimate that a sustained 20% gasoline price increase would reduce approximately 2,000 U.S. traffic crash deaths (about 5% of the total), plus about 600 air pollution deaths. Fuel price impacts on traffic crashes have been quantified in various U.S. regions. Fuel price increases reduce both total traffic crashes and distance-based crash rates, with impacts that vary by geographic and demographic factors, and increase over time. All these studies show that fuel price increases reduce per-mile crash rate, so a 1% reduction in total VMT provides more than a 1% reduction in total crashes. In Minnesota they estimate that a $1.00 per gallon gasoline price increase would reduce total rural crashes 28.2%, total urban crashes 18.4%, and urban fatal crashes 18.4%. They find that fuel price increases cause larger short-term crash reductions by younger drivers, and larger intermediate-term reductions by older and male drivers (2010a; 2011), and large drunk driving crash reductions (2010b). Since lower-income motorists tend to drive their vehicles fewer than average annual kilometers, and tend to respond to money saving opportunities, PAYD tends to be progressive with respect to income. According to a major Brookings Institution study, 64% of all households, and almost 80% of low-income households, would save money with PAYD insurance, averaging $496 annually per household that saves. Because annual vehicle travel tends to increase with income and lower-income motorists tend to respond most to money saving opportunities, PAYD insurance tends to be progressive with respect to income: lower-income motorists benefit more than higher incomes motorists. How Does PAYD Affect Consumers? Most motorists have some marginal-value vehicle travel that they will make if driving seems cheap, but not if they can save money. PAYD insurance gives motorists a significant new incentive to reduce their lower-value mileage, but it is not a new fee, just a different way to pay an existing fee. The vehicle travel foregone consists of vehicle-kilometers that motorists value less than the savings. For example, if a motorist who currently pays $1,400 annual premiums instead pays 7¢ per kilometer, and as a result drives 2,000 fewer annual kilometers, the reduced vehicle travel consists of kilometers they value less than 7¢, and their $140 savings represent consumer surplus gain, money they value more than the vehicle-kilometers foregone. A growing body of research indicates that PAYD vehicle insurance pricing can help achieve provincial policy goals including consumer savings and affordability (savings for lower-income households), road safety, reduced congestion and pollution emissions reductions. PAYD insurance is offered by private companies in several countries, including the U.S., Europe and Australia, but is not in Canada, including BC. In 1996 ICBC commissioned a technical study that examined its feasibility and impacts. The results were promising; they demonstrated the actuarial justification for PAYD, identified various benefits and described how it could be implemented. However, ICBC opposed the concept on the grounds that it is unproven and could reduce the corporation’s profitability, so no action was taken. Transportation is the largest single source of greenhouse gas emissions. In 2010 the BC Ministry of Environment and in 2014 the BC Climate Action Secretariat sponsored analysis of potential transportation emission reduction strategies, including PAYD. 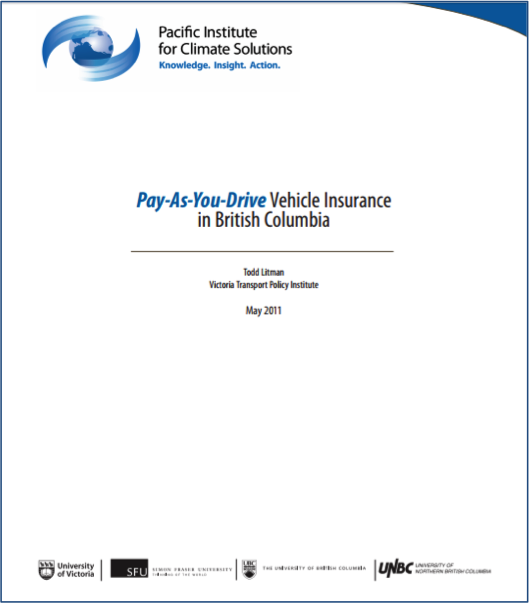 In 2011 the Pacific Institute for Climate Solutions (PICS) published, Pay-As-You-Drive Vehicle Insurance in British Columbia, which provided further support for PAYD as a climate change emission reduction strategy, but no further action was taken due to ICBC opposition. The recent ICBC review identified usage-based pricing using electronic vehicle tracking, as a possible safety and cost saving strategy, although basic PAYD is probably more cost effective and politically acceptable. PAYD insurance was recently recognized as a potential provincial traffic safety strategy. PAYD is particularly appropriate in British Columbia because ICBC has a social mandate, and so should favor policies that maximize affordability, safety, and environmental protection. This is a particularly good time to consider PAYD in BC because crashes and insurance premiums are increasing and the province is looking for innovative traffic safety and emission reduction strategies.